July 13, 2015 – The anti-austerity movement that led Prime Minister Alexis Tsipras’ Syriza Party to government in Greece finds less resonance on this side of the Atlantic, where most blame that government – and the Greeks who voted for it – for the economic crisis unfolding in that nation. A new Angus Reid Institute public opinion poll of more than 2000 Canadians and Americans finds the majority in each country sides with the “troika” of creditors: the IMF, European Union, and the European Central Bank over Greece. But in spite of the havoc wreaked on world markets as a result of the situation, North Americans do not appear to be as concerned about long term negative effects on their domestic economies, or their own economic fortunes. On July 5, Greek voters rejected an austerity package that would have included $9B – $10B (US) in public spending cuts and tax increases as a condition of more bailout cash. The country is in economic shambles. Unemployment hovers around 25 per cent, and a staggering 60 per cent youth unemployment rate have crippled the Mediterranean nation. Greece has, in effect, run out of money. Americans and Canadians however, are less sympathetic to the plight of the Greek people whom – in the eyes of respondents – are the makers of this mess, than they are to the legal right of international lenders to recoup billions of dollars in bailout funding. 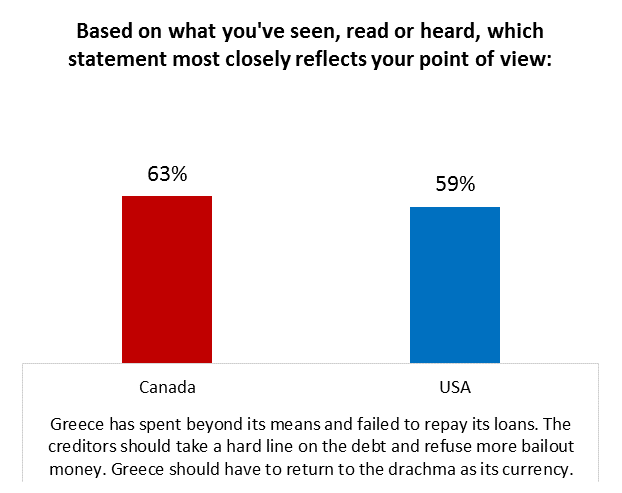 Nearly two-thirds (63%) of Canadian respondents feel the creditors should “take a hard line”, remove Greece from the Eurozone, and not offer any debt concessions. A similar number of American respondents (59%) agree with this sentiment. Roughly two-in-five Canadian and Americans are on the opposing side of this debate, and say the suffering of the Greek people should be considered, and some of the debt should be forgiven, allowing Greece to stay in the Eurozone. These respondents are likely sympathetic to the crippling effects of austerity, which have led to a 22 per cent reduction in both public sector wages and the minimum wage. In the US, Democrats are split down the middle on this question, 50 per cent each way. Republicans are less likely to side with Greece: one-third (33%) do so, with two-thirds 67%) on the side of creditors. Independents are more closely aligned with Republican supporters (37% – 63%). Nearly half of Canadians (45%) blame the government of Greece for the economic crisis. Athens’ runaway spending, generous pension plans and poor tax collection appear to resonate much more than criticisms from the leftist government regarding austerity conditions imposed by bailout packages over the past five years. In the face of what many describe as a desperate situation for Greece and her people, Canadians and Americans are anticipating the worst is yet to come. When asked if they see the situation in Greece improving or diminishing over the next two years, both nations see more pain for Greek citizens ahead. Just 12 per cent of Canadians and 13 per cent of Americans say the people of the country will be better off in 2017. And while the crisis has brought panic and instability to world trading and currency markets – spurring the Canadian dollar to drop to less than 80 US cents, neither Canadians nor Americans say they think the situation will affect their own finances. When asked whether they think their personal situation will change over the next two years, roughly one-in-ten (11% Canada, 14% US) said they anticipate being worse off, and the largest number (54% Canada, 39% US) say they will not feel a personal impact.